In Uma’s middle age, her rebellious cousin Ramu surprises the family with a visit after adventuring at sea. Mama and Papa are unhappy to see Ramu, for this son of Lila Aunty and Bakul Uncle is the black sheep of the family, but Uma is thrilled. Against Mama and Papa’s angry protests, Ramu persuades Uma into coming with him into the city to have dinner at a restaurant for the first time in her life. He reminds Mama and Papa of a time when he collected Uma from her attempts to run away to an ashram, a temple where worshippers stay as pilgrims. Uma accompanies Ramu to the Carlton Hotel, where she drinks shandy wine, laughs at Ramu’s jokes, and enjoys the live music. On the way home, she cries that the night is over, and when she arrives home, she tries to recount her happiness to her mother—who refuses to hear, calling Uma an “idiot” and a “hussy”. Uma’s cheerful hospitality toward Ramu in spite of her parent’s judgment of him as the black sheep shows that Uma has her own way of judging goodness. Uma soaks in every moment of her little adventure to the restaurant with Ramu. It’s not just the luxury of the fancy restaurant that she enjoys, but the laughter, the wine, and the temporary freedom to be enjoy herself. Uma’s desire to share her happiness with Mama is innocent and shameless. Mama further isolates herself from Uma’s true self by reproaching her. Uma is back in the house with no solitude, but in her heart and mind, she returns to her loneliness. The story flips back to Uma’s young adulthood. Mira-Masi has grown older and weak with fever. She comes to visit the family, and Mama urges her not to travel to an ashram in the foothills. Mira-Masi insists she will be okay if Uma can go with her. Feeling tricked, Mama lets Uma go. The perilous journey by beaten-down carriage and tough footpaths is all a big adventure for Uma. Once at the ashram, Mira-Masi focuses on her religious rituals, giving Uma the chance to wander freely all day through the river paths around the ashram. Uma realizes, while falling asleep on the stone floor beside Mira-Masi, that she has never been so happy as now. Uma has another seizure while there, but the pilgrims and worshippers respond to Uma’s seizure with wonder and respect. Fellow pilgrims readily accept Mira-Masi’s explanation that Uma seizes because she is chosen by lord Shiva. Only when Mama and Papa feel cornered by social situations do they allow Uma to leave home. Rather than to see her epilepsy as a curse, as MamaPapa do, Mira-masi and the other pilgrims see Uma’s seizures as a sign that she is holy. Their opinion represents a truth about Uma that MamaPapa cannot see—that Uma is special, that she has a spiritual plenty inside of her. As Uma wanders by herself at the ashram, she finds happiness because she is free to meander and find a kind of freedom that she finds only in solitude. Uma’s ability to find happiness just in her own company makes her different than most other characters in the novel. After a month at the ashram, two unexpected visitors turn out to be cousin Ramu and Arun, a young boy at the time. Ramu tells Uma that he has come on Papa and Mama’s instructions to reclaim her, for she has stayed much longer than they expected, and they are imagining her to have been kidnapped. Mira-Masi prepares herself to face down Ramu – who she sees as a hooligan for his bad manners and western, metropolitan ways. The two fight quietly all afternoon over Uma’s fate, but in the end, Ramu wins Uma herself over by charming and distracting her with his laughter and warmth. Uma is already on the carriage out of the ashram before she sadly realizes what she is allowing to happen, and then she refuses to eat or laugh all the way home. While there are huge differences in character between Ramu and Mira-Masi, both relatives at different times offer Uma the chance to have adventure. Yet, it is only Mira-Masi who refuses to cooperate with the authority that MamaPapa try to have over Uma. As a woman free of the authority of any man, whether husband, brother, or father, Mira-Masi seems to be immune to the power that male relatives have in their society. Uma’s innocent love of Ramu keeps her from realizing the freedom that she is giving up, but when she does, she feels a great loss. Ballinger-Dix, Elizabeth. 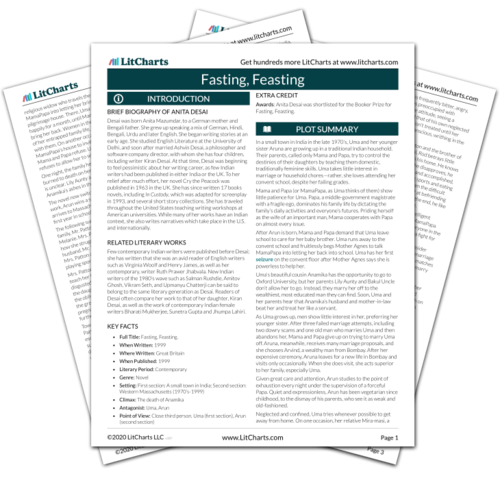 "Fasting, Feasting Chapter 5." LitCharts. LitCharts LLC, 7 Sep 2014. Web. 17 Apr 2019. Ballinger-Dix, Elizabeth. "Fasting, Feasting Chapter 5." LitCharts LLC, September 7, 2014. Retrieved April 17, 2019. https://www.litcharts.com/lit/fasting-feasting/chapter-5.